Rabbit Hill Inn Raw Kale Salad with pickled apples, black barley, walnut brittle, and curry vinaigrette. 5 great recipes in one! Kale is an incredibly healthy super green! And if you have never tried it before, this is your opportunity to do something really good for yourself. It’s bursting with nutrients, flavor, and hearty crunch. This delicious kale salad was a HUGE hit on our fall menu. After several guest requests, our chefs provided the detailed recipe. It looks like a long, complicated recipe. Don’t get discouraged – it really isn’t complicated at all. The steps are just broken down for easy prep. Some steps can be done in advance. BONUS: You may find yourself using these 4 component recipes in many other dishes. as well. In a shallow pan, lined with parchment paper, spread walnuts. Set aside. In a sauce pan, heat water/vinegar and sugar until light brown. Pour liquid over walnuts. Allow to cool. Chop into pieces and sprinkle over completed salad before serving. Combine all ingredients except apples in a sauce pan, over high heat. Boil for 3 minutes. Sauté onion and spices in 1 Tbsp Grapeseed oil until tender. Combine all ingredients in blender until smooth. Set aside. Serve at once or keep warm. 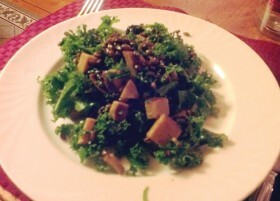 On individual serving plates, place even portions of barley and kale. Add apples. Dress with vinaigrette. Sprinkle top with crushed walnut brittle. This entry was posted in All things Culinary, General, Recipes, Uncategorized and tagged B&B in Vermont, baking recipes, barley recipes, bed breakfast recipes, Best B&B Vermont, best brunch recipes, best easy kale recipe, best kale recipe, best restaurants near Vermont Canadian border Rabbit Hill Inn, best vegetarian recipes, best Vermont restaurants Rabbit Hill Inn, boutique Vermont hotel, brunch menu ideas, cooking with apples, cooking with barley, cooking with chestnuts, cooking with kale, curry recipes, curry salad dressing recipe, curry vinaigrette recipe, dinner party recipes, easy barley recipes, easy brittle recipe, easy brunch salad recipes ideas, easy fall recipes, easy luncheon recipes, easy new kale salad recipe, easy party recipes, fall winter recipes, healthy diet, healthy salad ideas, healthy salad recipes, how to cook barley, how to cook with curry, how to make curry salad dressing, how to make pickled apples, how to make walnut brittle, kale recipes, kale salad, kale salad recipes, luncheon menu ideas, luxury Vermont hotel, New England vacation, pickled apples recipe, Rabbit Hill Inn recipes, recipe black barley, romantic new england bed breakfast inn, salads, snack cake recipes, stuffed apples for dinner recipes, Vermont, Vermont bed breakfast inn, Vermont restaurants Rabbit Hill Inn, walnut brittle recipe, walnut recipes by leslie. Bookmark the permalink.